Often considered a challenge for teenagers, acne can affect women and men of all ages. Such skin problems often result from a combination of hormone stimulation, and increase in sebum production, bacteria, stress and poor diet. However, with proper nutrition, healthy stress-reduction techniques, select nutrients and other strategies, blemishes can be both controlled and prevented. Along with Futurebiotics AcneAdvance and a comprehensive multi-vitamin, eat a well-balanced diet that includes plenty of whole grains, fruits, vegetables and lean protein. Increase intake of foods naturally high in vitamin A (dark colored fruits & vegetables, lean protein) and zinc (nuts & legumes) as both are important to skin health. Avoid refined and/or concentrated simple sugars and iodine. Exercise can help reduce stress and increase circulation. Get at least 30 minutes of daily aerobic exercise. Exercise also benefits the skin and aids in maintaining a clean, youthful complexion. Stress can play havoc with your complexion. Simple deep breathing exercises or meditation can help reduce stress. To help reduce the incidence of hyperpigmentation, the dark spots left over from healed blemishes, use SPF 15 sun protection on exposed areas and reapply throughout the day. Drink plenty of clean, pure water to help flush toxins and keep skin hydrated. Chronic use of antibiotics often triggers intestinal overgrowth of the yeast Candida albicans. This chronic yeast condition may actually make acne worse and should be treated if present. Clean skin gently. Over-washing is actually irritating and excess irritation can worsen acne. Use bare hands to wash and only wash twice a day. Wash your pillowcase regularly in chemical-free detergents. Use oil-free cosmetics. When possible, use products that are labeled as noncomedogenic (not tending to clog pores). Clear, healthy skin is possible regardless of your age. With proper nutrition, exercise, good hygiene and effective stress reduction techniques, you will see a visible difference that benefits both your physical and emotional well-being. AcneAdvance - taking inspiration from Nature. This 100% vegetarian product (contains peptides from milk) has an aromatic botanical essence added. Glass packaging extends natural freshness and helps maintain potency. Bioactive Protein Complex with Lactoferrin - Clinically proven to reduce blemishes and redness. Clinical research has shown that the ingredients in AcneAdvance, including Lactoferrin, LinumLife and Zinc help improve the look of skin by helping to balance hormone levels and by reducing redness and inflammation associated with a poor complexion. Lactoferrin is a natural, biologically-active milk protein isolated from whey. Clinical studies have shown the Lactoferrin significantly reduced blemishes, with visual results seen within two weeks. This all-natural ingredient promotes a healthier complexion by enhancing the body's natural defenses to assist in fighting bacteria, reducing redness from inflammation, and helping to repair damaged cells caused by blemishes. LinumLife Complex provides lignans from Flax, a well-recognized group of phytoestrogens with estrogenic and anti-estrogenic action, which may help in the treatment of acne. Produced through a proprietary process, LinumLife Complex is concentrated and provides between 10 to 30 times more lignans than whole flax or other flax ingredients. 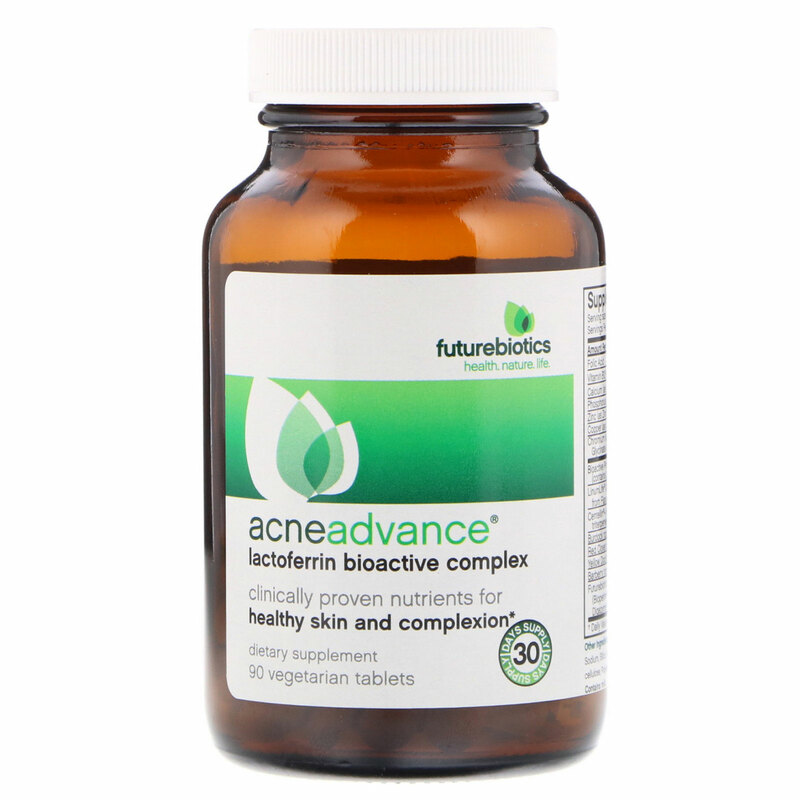 AcneAdvance is further enhanced with select herbs and nutrients. A recent study using an "inflammatory score" showed the effectiveness of Zinc Gluconate on acne, while Chromium has been reported to improve acne by supporting glucose tolerance. Burdock, Yellow Dock and Red Clover act as natural internal cleansers to help remove toxins. Centellin, a standardized extract of Gotu Kola, helps increase blood circulation to the skin's surface and provides cleansing and healing actions. 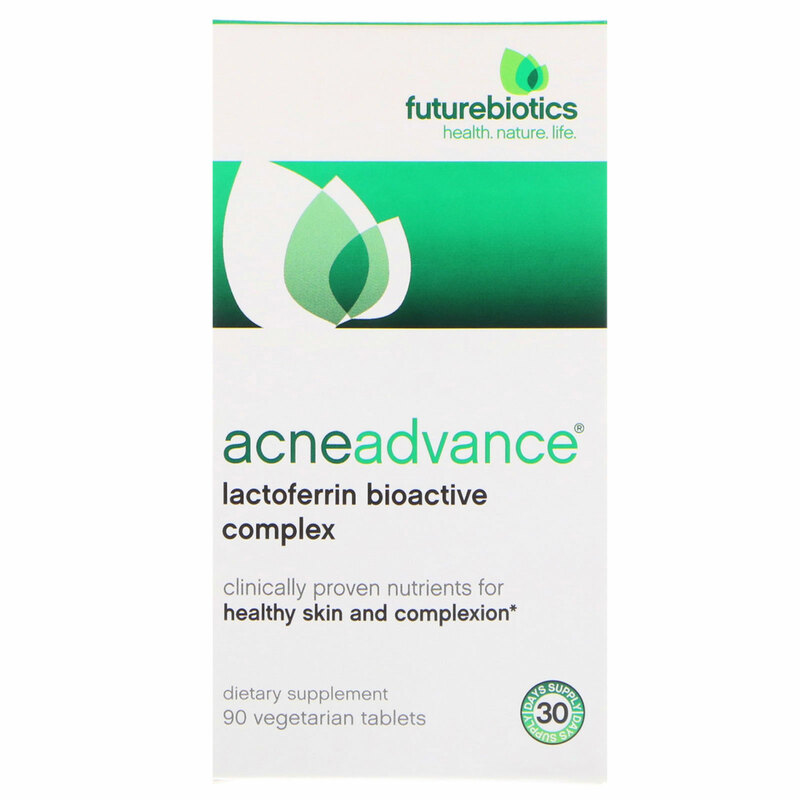 AcneAdvance is potency-enhanced with Futurebiotics BioAccelerators. 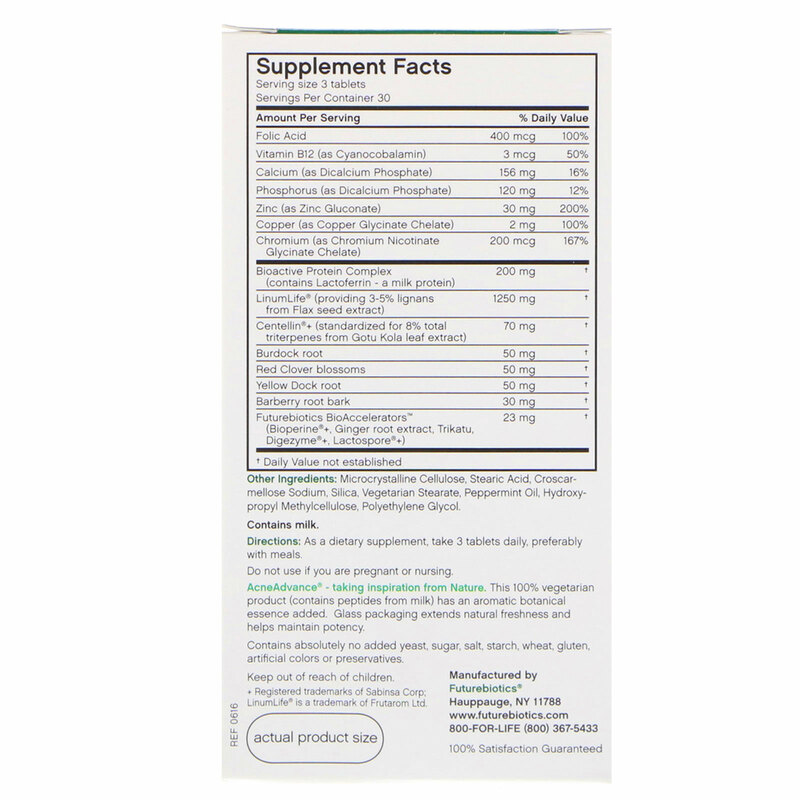 Clinically-proven Bioperine (Piper nigrum extract) improves nutrient bioavailability, while our proprietary natural compound of Ginger extract, Trikatu, super-potent Digezyme+ and Lactospore+ boosts digestion and absorption. Oral supplementation with lactoferrin resulted in a median decrease of 71% in complexion blemishes after one month and 95% after two months. As a dietary supplement, take 3 tablets daily, preferably with meals. Microcrystalline cellulose, stearic acid, croscarmellose sodium, silica, vegetarian stearate, peppermint oil, hydroxypropyl methylcellulose, polyethylene glycol. Contains absolutely no added yeast, sugar, salt, starch, wheat, gluten, artificial colors or preservatives.